The center of the Milky Way galaxy is currently a quiet place where a supermassive black hole slumbers, only occasionally slurping small sips of hydrogen gas. But it wasn't always this way. A new study shows that 6 million years ago, when the first human ancestors known as hominins walked the Earth, our galaxy's core blazed forth furiously. 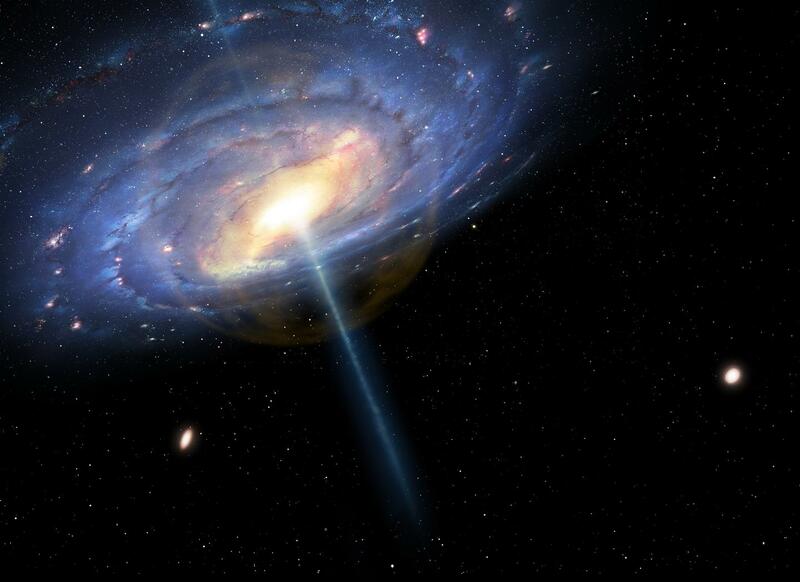 The evidence for this active phase came from a search for the galaxy's missing mass. Measurements show that the Milky Way galaxy weighs about 1-2 trillion times as much as our Sun. About five-sixths of that is in the form of invisible and mysterious dark matter. The remaining one-sixth of our galaxy's heft, or 150-300 billion solar masses, is normal matter. However, if you count up all the stars, gas and dust we can see, you only find about 65 billion solar masses. The rest of the normal matter - stuff made of neutrons, protons, and electrons - seems to be missing.